Natasha Wilson, who graduated from GISS in 2018, won the Victoria's Got Talent contest on March 2. She will release her first EP under her performing name of Tasha Belle in June. 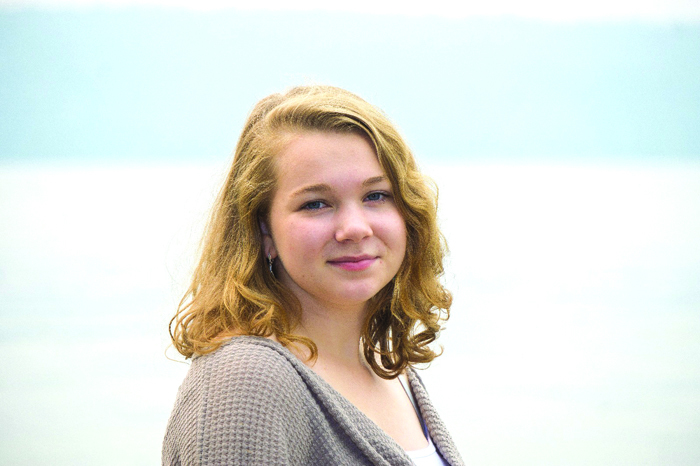 Salt Spring Island has produced another budding young singer whose combined talent and drive seem bound to propel her to the next level. The just-turned 18-year-old Natasha Wilson is putting in the work required to make it in a competitive industry, and she has the voice and songwriting skills to get her there. Wilson was selected as a top-20 finalist for the 2019 Victoria’s Got Talent contest and emerged as the winner at the March 2 showcase event. She’s now getting ready for the release of her six-song EP called Woven Heart under her artist name Tasha Belle. Wilson said that winning the contest was thrilling and has sparked her desire to reach an even greater level. “It’s like the first milestone. Now that I’ve done that I can’t help but think ‘What’s next?’ and I want to find the next milestone,” she said. Like other island singers who have gone on to win attention at regional and national levels, Wilson polished her chops at the Gulf Islands School of Performing Arts, getting essential training from teachers Bruce Smith and Michelle Footz. Viva Chorale choir director Deb Toole was another early influence. After an initial exploration, Wilson decided not to pursue music as part of her post-secondary education, and is studying criminology instead. This self-directed path is one that Wilson’s album producer Andy Meyers approves of. He’s found the young singer to be focused and open to feedback in his Allowed Sound studio, and able to interpret information back into her performance if she wishes to. Wilson’s inspiration as a songwriter comes from her direct life experiences and important people in her life. One of the songs on her upcoming EP was co-written with her good friend Grace Pohl. Another song is about her feelings for her younger sisters. Meyers has meanwhile been impressed with Wilson’s willingness to include some darker imagery and uncomfortable experiences, adding a mature edge to her work. Wilson acknowledges that she’s been struggling with anxiety recently as the shift from high school in a small community to a much wider world is a bigger one than students sometimes realize. “That’s why it’s really great to have the support of friends and family. I’m not afraid to write about the things that I’m upset about as well as the things that make me happy,” she said. Wilson has also attracted support from professionals in the music industry. She met up with Kelowna country music star Ben Klick at the Rock Creek Fair a couple of years ago and he was happy to share advice about everything he knew. More recently she’s benefitted from an old Salt Spring connection in her dad’s former high school music teacher Wilf Davis. He’s taken Wilson under his wing in Victoria, introducing her to industry people and getting her gigs. His band Southbound and Friends will accompany Wilson at her June album release event. Despite having a little bit of a leg up, Wilson said that her experience with Victoria’s Got Talent has given her more perspective on just how difficult the music industry is to get into.